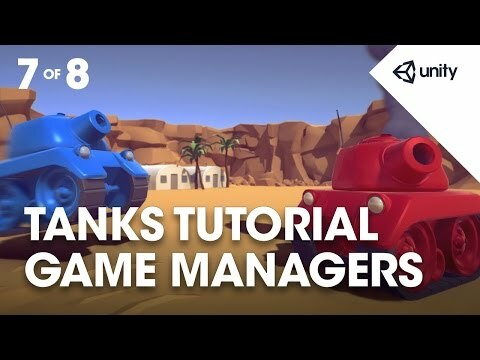 Phase 7 teaches you all about the architecture of the game - the tank and game managers which handle creating the rounds and deciding the winner of the game. We also learn about coroutines and how they are used in scenarios like this. that you've won the game. There is it turning red. Player (number) wins the round! the spawn points for each tank. I'm going to rename this one SpawnPoint1. Then I'm going to duplicate it. And I'll give you some positions for those. So SpawnPoint1 is (-3, 0, 30). With a rotation of (0, 180, 0). slider because I've got both spawn points on at once. Rotation 180 in the Y axis, 0 in the other two. ensuring a rotation of SpawnPoint2 is (0, 0, 0). that is not going to make a huge difference. else in your game feel free to go ahead and do that. because that's where you want the tanks to start. it's very difficult to see them in the scene. and give it what we call a gizmo. of something in the scene view. So if you reselect SpawnPoint1. there's this little cube icon. If you click down you can choose from a number of gizmos. But for this we're just going to select a blue background. we're going to choose red. Okay, so that's where my two spawn points are. UI is over the entire screen. So that's what we're going to do now. and it should look like that if you've done it right. And you can't really get it wrong because that's the default. first off I'm going to set the scene view to 2D mode. by the scene tab that says 2D, click on that. It's going to constrain to a particular axis. or you can go to Edit - Frame Selected. to kind of frame that in the scene view. the middle of our canvas. It should look like that. screen except for a border around the edge. and will ultimately fit it in to this canvas. and a maximum of 0.9. So it should look like this. and then X, Y across again. so 0.1, 0.1, 0.9, 0.9.
of the screen that we've got. is basically starting up in the upper left there. new game object to it. just creating this pad around the outside. being wider than it is tall. I'll reset all of those left, right, top, bottom to 0. So then we'll actually work with the text component. so I'm going to write in TANKS! So feel free to do that. So that'll place it right in the centre of the screen. And set the maximum size to 60, 60. And the color to White. So the font is BowlbyOne-Regular. a Min and Max size, I set the maximum to 60.
just by dragging up in this color panel. It should look like this if you've got it right. a drop shadow to it, nice and simple. And for that we have a separate component. very simply and you can hit Return. a kind of brown color to go with the sand. I'm going to set the Effect Distance to -3 in X and Y. If you want to get artistic at this point, feel free. and then zoom back in to where I was. when not in 2D mode and zoom in. and we've set the text to say TANKS! We have used circle select to choose our font. It's a free font that we took from Google. We've set the alignment to centre and middle. where we've set it up. to scale up to the maximum size. Then we set the color to White. be brown and (-3, -3) for the Distance. So that's back to the left and down a little. when there's more than one tank. is that we now have something missing. the thing at the bottom here, this thing. our tank so it can't find it any more. to be there at all, we want the script to handle it for us. to go back to editing it. this there was that HideInInspector bit at the top? is no longer seen in the inspector. we're just removing the / and * either side of it. you'll notice that the camera control no longer shows that bit. And compiled, there we go. on to, which is exactly what we needed. and I'm going to name it GameManager. select and go back and set everything up on. So our GameManager is going to be an independent object. to explain what the tank manager does shortly. GameManager and drop it on to my GameManager object. drop it on to the GameManager object. because there's a fair bit to it. and as we said earlier there are 5 rounds to win. read the text that's on the screen. a reference, so that's the first thing we're going to setup. so this is expecting something of type Camera Control. on to that, then that will assign it. I have my text game object. drop that on to assign it too. and I'm going to grab and drop my tank on there. there is an array at the bottom called Tanks. Which if you expand has size. So as we know there are 2 tanks in our game. to it and hit return you will see there's Element 0 and Element 1.
instead of 1 and 2, it's 0 and 1. So this color will get used for both of those things. I'm going to setup red and blue for this. So Element 0, I'm going to click on the color block. So shade of blue like that. the name tag gizmo that we gave Spawn Point 1. Then Element 1 will have a different color. I'm going to recap these in a moment. (229, 46, 40) R, G and B.
the spawn point to drop on. and also color the UI for us. like the text and the camera rig. blue of (42, 100, 178). And then color of red (229, 46, 40). which should also be dragged on. Okay, so let's talk about our GameManager. as we've told it to, in this case 2.
focus in on them when the game starts'. Then it needs to run the states of the game. which is a separate script. and also visual elements, I.E. the UI. turning off input, control, and shooting. it's tank manager there to sort it out. it can do more things. that we need to understand. Double click on the icons to open both those scripts. And make sure you're looking at the TankManager. this one are mono behaviours. name of the class you've got a colon and then MonoBehaviour. Update, Fixed Update, those sorts of things. That's all part of mono behaviour. But this one does not have that. It's not inheriting from anything before that. you can show it in the inspector'. by default fields are serializable. so that it'll show up in the inspector. Okay, so let's have a look at the public variables. the tank and it's name. and in what direction it's going to be spawned. filled in in the inspector. only things that are down in the inspector. is an array of tank managers. we're saying 'hide those from the inspector'. so if I jump over to Game Manager really quickly. so that's why you're seeing that in the inspector. be able to adjust those. they're based on the PlayerNumber. that came up was in the color of the player. but that's just a variable to store that. storing the instance of the tank. get that referenced through the instance. gets enough wins it'll win the game. so we can turn those on and off when we need to. so that we can turn the UI on and off. Next we've got a public function called Setup. the GameManager when it first creates these tanks. by saying that the Instance, get component from the instance. So set the instance, get the components there. and then we're getting the game object that that's on. That's what that bit is doing there. And then there's the HTML-like rich text. of the text and then putting stuff in between them. 'Player 2 - X number of wins'. adding bits to a string. the text is after that, and the thing it's coloring is Player. HTML tags fit inside angled brackets. so that will result in a color reference. Then we put in a space. And then we finish coloring. by using this rich text'. through it it makes sense. So the next line is getting an array of mesh renderers. 3D objects in the scene. tracks, one for the chassis, one for the turret, etcetera. I'm just going to show that real quick. they disappear because they're not being rendered any more. That's just what a mesh renderer is doing. that are mesh renderers and return them. that are going to be called by the Game Manager. and turns on the canvas. instance back to it's spawn point. we can turn it back on again. Okay, so that's all there is to TankManager. Let's see about the GameManager. So just to jump back to this slide real quick. it's going to use the TankManagers to spawn those. So let's take a look at that. see the stuff that we're looking at right now. Either that or you can look at the screen. So there are three blocks of comments in this one. There's one at lines 19 and 21. I'm just going to remove those. There is one at line 66 to line 74.
all the way down to 152.
so we just commented those out. public variables, I won't bore you by doing it again. so we've got an integer which stores the current round number. Then we've got these two WaitForSeconds things. a delay in your function course. What is a coroutine James? I think we'll cover that shortly. classes so we can use them. that are the RoundWinner and the GameWinner. message at the end of each round. which is setting up those WaitForSeconds. for the start and the end. that StartCoroutine thing at the end. and then we're spawning it at the spawn point of the tanks. to fit on a projector. a tank per instance as required. Player 1 failed', you don't want that. in a minimum of Player1, Player2 and so on. function that we covered in TankManagers. movement, shooting and coloring and whatnot. this Targets array that we just created. and we'll just assign them to the CameraControl script'. it's parameters, which is a bit weird. So let's find out what that's all about. it starts the GameLoop to continue. So it's starting the GameLoop coroutines. and how you can use those. We need to talk about coroutines. is going to start the round. to start playing, driving around. It's then going to wait. they're actually firing, shooting each other, running around,. Then it's going to wait. And then the round is going to end. wait for a certain condition to be valid. And that's where coroutines come in. and then some commands within that. we have this thing called IEnumerator. it's just the return type. word yield in the middle of it. but then we can stop at this point called yield. or some condition to be true. in again at the same point that it yielded. And then it will continue on with the coroutine. function, which could be very useful. with a yield instruction in the middle. then we're going to do what's in those brackets'. so let's suppose that the condition is true. It goes in to the while while loop and hits that yield. and continues with that while loop. and then come back in again after a period of time. we'll then go back in to the same while loop. do this, come back next frame. Oh there's still not 1 tank left, come back next frame. Until there was, and then the function would finish. The coroutine that it's starting is the GameLoop. So let's have a quick look at the GameLoop. To see what's going on there. of it to finish before it continues on. before it goes on to the next one. so if GameWinner is not equal to null. loadedLevel, that's just reloading this current level. yield return on that bit. function will finish and there will be another GameLoop running. at how the GameManager and TankManagers interplay. So we've just talked about the GameLoop. and all these kind of things. TankManager assigned to it and we do that. and setting the positions back where they should be. shoot and the UI is off. their Health UI just yet. and we setup the zoom using the size. if it's 0 we make it Round 1.
say either Round 1 or whatever is appropriate. that in the script now. 3 seconds and then do nothing else. little bit of code before that. First off we said we wanted to reset all of the tanks. we've got a function called ResetAllTanks. So put a call to that. control their tanks while the round is actually starting. to that, we want to set it. because a new round has just started. All that does is just add 1 to that round number. Round and then the round number. component, well named isn't it? Round1 like that on the screen, which you don't want. parse it straight in to the UI text. there and give that a test, see how that all works. Okay, so I'm going to save my script, switch back to Unity. And I'm going to press Play. Okay, so this isn't working as well as I thought it might. Interestingly it's just counting up the rounds. Why would that be James? the RoundPlaying bit, that'll probably do it. oh hey, there's a new round'. and jump back in to my code. that's all it's doing there. So just to jump back to the slide. Resetting and DisablingControl so that's all good. But RoundPlaying, so what do we do in RoundPlaying? played just now we noticed you couldn't drive or shoot. So EnableControl is in TankManager. It can move, it can shoot and it sets up the UI. And the thing it needs to do is empty that message. the word Round 1 on the screen, we want to scrub that out. else we just empty the message string. we just keep waiting until there's one tank left. Let's see how we write that. so you can actually play the game. through all the tanks and calls their EnableControl. So nothing really to it. = string.Empty so that's just a blank string. go on to the round ending. use that while loop that we saw earlier. there is one tank left, or less. is placing it around yield return null. Adding lots of lines for no reason. going away one frame and waiting for it to become true. and I'm going to hit Play and see what happens. So I knew it, I can drive around. but I've got no idea who won that round or what happened. which I think we all know is wrong. So back to our slides. yeah, it's a little bit jazzy for my tastes. nice pause in the game as well. and decide who's just won this round. rounds won and therefore are them game winner. So let's have a look at how that works. And we've currently got a yield that's got the EndWait. we need to do a bunch of stuff. so we'll call that DisableTankControl function. before we can check for another one. set m_RoundWinner to equal null. particular tank, same for the GameWinner. one that's active and return it. Shall we have a look at that function? Yeah we can have a quick look at that. 130 for me but it might be a bit different for you. But what you'll see is GetRoundWinner. And it's going to go through all of the tanks. in the array, IE the length of the array. So it's activeSelf is true. And it's going to return that tanks. that means there's going to be a draw. to blow themselves up at the same time. It is possible, I've seen it, maybe once. we're going to check whether it is null or not. So if that RoundWinner is not equal to null. So ! for not equal to. to that round winner's number of wins. ++ just to iterate it once. the number of wins that tank's got, lets add 1 to it'. they might have won the entire game. So now we can check if there is a GameWinner. Yeah, let's just take a look at GetGameWinner. number of rounds required to win the entire game? that's got the right number of wins. whether there is a GameWinner, etcetera. and setting it equal to the EndMessageReturn. setting the MessageText's text to that message. then we could do that here. setting the text straight away. So we're calling this EndMessage function. very confusing looking set of strings and text. is that there's a draw. anything at all so we don't worry about it at all. Then we decide if something different that a draw has happened. I.E. is there a RoundWinner? Then we're going to send something to the message. 'hey, Player 1 WINS THE ROUND!'. piece of text that we're going to put in to that text field. things within the overall message. just means go to a new line. then start writing something else'. we have a for loop. and then the number of wins that are found for that tank. then put in a space and the word WINS. for the next tank in the loop. Player 2, and so on. we clear it out, put it in. That's whoever won the game. what's just happened in the round. and fight because it's a tank game and that's how it works. for one player, and spacebar to fire. Then you've got arrow keys and return for the other player. Okay, so we're going to do the same. // This class is to manage various settings on a tank. // different phases of the game. public Color m_PlayerColor;                             // This is the color this tank will be tinted. public Transform m_SpawnPoint;                          // The position and direction the tank will have when it spawns. [HideInInspector] public int m_PlayerNumber;            // This specifies which player this the manager for. [HideInInspector] public string m_ColoredPlayerText;    // A string that represents the player with their number colored to match their tank. [HideInInspector] public GameObject m_Instance;         // A reference to the instance of the tank when it is created. [HideInInspector] public int m_Wins;                    // The number of wins this player has so far. private TankMovement m_Movement;                        // Reference to tank's movement script, used to disable and enable control. private TankShooting m_Shooting;                        // Reference to tank's shooting script, used to disable and enable control. private GameObject m_CanvasGameObject;                  // Used to disable the world space UI during the Starting and Ending phases of each round. // Get references to the components. // Set the player numbers to be consistent across the scripts. // Create a string using the correct color that says 'PLAYER 1' etc based on the tank's color and the player's number. // Get all of the renderers of the tank. // ... set their material color to the color specific to this tank. // Used during the phases of the game where the player shouldn't be able to control their tank. // Used during the phases of the game where the player should be able to control their tank. // Used at the start of each round to put the tank into it's default state. public int m_NumRoundsToWin = 5;            // The number of rounds a single player has to win to win the game. public float m_StartDelay = 3f;             // The delay between the start of RoundStarting and RoundPlaying phases. public float m_EndDelay = 3f;               // The delay between the end of RoundPlaying and RoundEnding phases. public CameraControl m_CameraControl;       // Reference to the CameraControl script for control during different phases. public Text m_MessageText;                  // Reference to the overlay Text to display winning text, etc. public GameObject m_TankPrefab;             // Reference to the prefab the players will control. public TankManager m_Tanks;               // A collection of managers for enabling and disabling different aspects of the tanks. private int m_RoundNumber;                  // Which round the game is currently on. private WaitForSeconds m_StartWait;         // Used to have a delay whilst the round starts. private WaitForSeconds m_EndWait;           // Used to have a delay whilst the round or game ends. private TankManager m_RoundWinner;          // Reference to the winner of the current round. Used to make an announcement of who won. private TankManager m_GameWinner;           // Reference to the winner of the game. Used to make an announcement of who won. // Create the delays so they only have to be made once. // Once the tanks have been created and the camera is using them as targets, start the game. // ... create them, set their player number and references needed for control. // Create a collection of transforms the same size as the number of tanks. // ... set it to the appropriate tank transform. // These are the targets the camera should follow. // This is called from start and will run each phase of the game one after another. // Start off by running the 'RoundStarting' coroutine but don't return until it's finished. // Once the 'RoundStarting' coroutine is finished, run the 'RoundPlaying' coroutine but don't return until it's finished. // Once execution has returned here, run the 'RoundEnding' coroutine, again don't return until it's finished. // This code is not run until 'RoundEnding' has finished. At which point, check if a game winner has been found. // If there is a game winner, restart the level. // If there isn't a winner yet, restart this coroutine so the loop continues. // Note that this coroutine doesn't yield. This means that the current version of the GameLoop will end. // As soon as the round starts reset the tanks and make sure they can't move. // Snap the camera's zoom and position to something appropriate for the reset tanks. // Increment the round number and display text showing the players what round it is. // Wait for the specified length of time until yielding control back to the game loop. // As soon as the round begins playing let the players control the tanks. // Clear the text from the screen. // ... return on the next frame. // Stop tanks from moving. // Clear the winner from the previous round. // See if there is a winner now the round is over. // If there is a winner, increment their score. // Now the winner's score has been incremented, see if someone has one the game. // Get a message based on the scores and whether or not there is a game winner and display it. // This is used to check if there is one or fewer tanks remaining and thus the round should end. // Start the count of tanks left at zero. // ... and if they are active, increment the counter. // If there are one or fewer tanks remaining return true, otherwise return false. // This function is to find out if there is a winner of the round. // This function is called with the assumption that 1 or fewer tanks are currently active. // ... and if one of them is active, it is the winner so return it. // If none of the tanks are active it is a draw so return null. // This function is to find out if there is a winner of the game. // ... and if one of them has enough rounds to win the game, return it. // If no tanks have enough rounds to win, return null. // Returns a string message to display at the end of each round. // By default when a round ends there are no winners so the default end message is a draw. // If there is a winner then change the message to reflect that. // Add some line breaks after the initial message. // Go through all the tanks and add each of their scores to the message. // If there is a game winner, change the entire message to reflect that. // This function is used to turn all the tanks back on and reset their positions and properties.